The Ministry of Health and Medical Services officials were yesterday still trying to verify a report claiming that Fiji had the highest rate of Diabetes Metillus in the world. The World Life Expectancy, is said to be the latest in a series of Educational Experiences developed by LeDuc Media, a global research and strategic market­ing resource for organisations around the world. 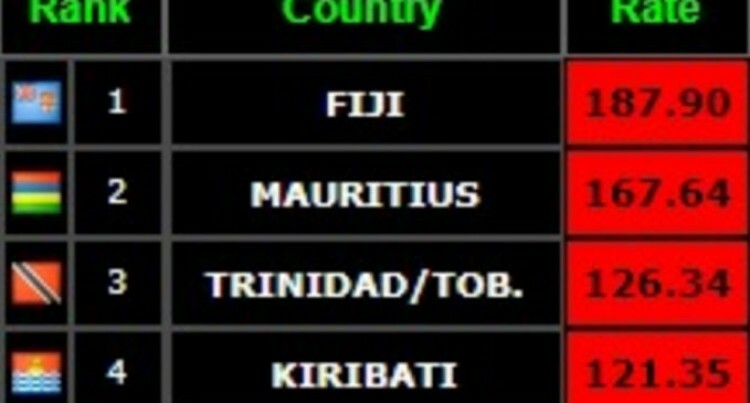 It says that Fiji had 187.90 mortality out of 100,000 deaths. The data used was from the World Health Organisation. In addition, the recent data from these primary sources: WHO, World Bank, UN­ESCO, CIA and individual country databases for global health and causes of death. Another shock­ing revelation made by this website was that out of the Top 20 countries with the highest diabetes mortality, seven countries were from the Pacific. The island nations featured in the Top 20 includ­ed Kiribati, Tonga, Solomon Island, Samoa, Micro­nesia and Papua New Guinea. According to World Health Organisation, the rea­son behind the high rate of diabetes mortality in Pacific was due to dietary changes. It said in Fiji, the population was abandoning its traditional food and moving towards processed and modified food. A comment from the ministry was not available by the time this edition went to press.